So the first cocktail we're going to try is the Sidecar. Like a lot of older drinks, its origin is not completely confirmed. Like some other older drinks, neither is its recipe. 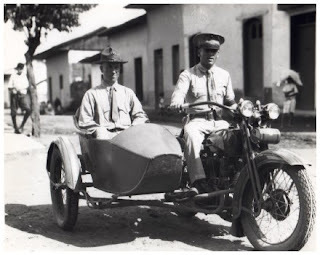 We're going to look at where the Sidecar came from (probably), when it came from, and then really get into the experience by learning about the culture of its time and place of origin as well. The more likely truth is that there are two separate accounts in 1922 that give credit for the recipe to Pat MacGarry, who was the main bartender at Buck's Club in London, which opened in 1918. So, it's likely a British-made drink, but possibly a French-made drink. Nonetheless, it is made with French ingredients, and became famous mostly in Paris at one particular bar, so we will stick with the French side of things for our theme today. The very practical side of this drink's creation is a natural evolution from older cocktails (as is often the case), namely the Crusta - a style of libation first published in 1862 by Jerry Thomas, the grandfather of mixology himself. It includes brandy, lemon juice, curacao, simple syrup, and bitters. Cocktails containing orange liqueur, a spirit, and citrus evolved into many different cocktails we know today (see my post on The Margarita and its evolution from the Daisy Cocktail). to Prohibition among other things), and the bar was intended to be a place where expatriates from America could feel at home. After MacElhone took over, the bar became arguably one of the more famous in the world. George Gershwin composed "American In Paris" here, and it claims fame to creating some of the more famous classic cocktails, including the Bloody Mary, the French 75, the Monkey Gland, and, as we are discussing today, the Side Car. 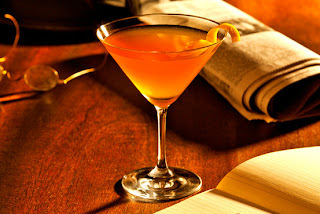 The earliest printed recipe has all parts equal (known as the "French" or "Paris School"), but the most famous recipe is in Harry Craddock's Savoy Cocktail book, which lists cognac to lemon juice and Cointreau at 2:1:1 (this is the "English" or "London School"). Like any other classic cocktail, the ratios are different depending on the bartender and, of course, how you like your drink. Embury, from "The Fine Art of Mixing Drinks" even lists the ratio 8:2:1, cognac to lime to sugar syrup (a Daquiri with brandy instead of rum). I generally prefer my cocktails spirit-heavy, and a little on the sour side when using juice. Using a nicer cognac, rather than a cheap brandy (as is often the case unfortunately), I suggest a 4:1:1, maybe with an extra dash or two of juice. In cocktail books in the 1930's, the recipe also included a sugar rim for glass, like a Crusta (the Cocktail's forgotten brother). If you're making the drink very strong or very sour, this can be a nice addition, but overall I quite dislike very sweet drinks and feel it's unnecessary. Cognac (which should be used) is a brandy made in the Cognac region of France from a grape wine (with other very strict production rules, from location and grape-type, to the double-distillation technique, to the wood from which the barrels are made in which the brandy is aged). Cointreau is the original type of triple sec. A triple sec is a liqueur made from a typically neutral (flavourless) spirit, then flavoured with orange peels. A liqueur is a spirit that has been flavoured and then bottled with added sugar. Cognac is unfortunately not cheap, and a 750mL bottle will run you about $55 in BC. If you just want to try the drink with a cheap brandy, you can get a 750mL bottle for about $23, though be warned - the drink will not be as smooth. If you're not used to the taste of brandy, I suggest going French or English school with the recipe to start so you don't get turned off. You can save almost 50% by getting a cheap triple sec, but these tend to be overly sweet and kind of gross. Cointreau has a much more subtle and orange-y flavour that really does make a difference to your cocktails. As for the lemon juice - use real lemons!! Never use a sour mix or bottled lemon juice in cocktails. You will ruin your drink and waste your other ingredients. Getting a hand-held juice is easy and cheap (I got mine for $6), or if you just want to jump right in... half of an average lemon is about 1oz of lemon juice. Measuring properly always gives more balanced drinks though! Paris was an epicentre of art and literature in the 20th century, and in the 20's Art Deco was beginning, Dadaism was leading to Surrealism, and many famous artists and writers made the city their home, such as Salvador Dali, Pablo Picasso, Ernest Hemmingway, James Joyce, and Gertude Stein. Art was in a revolutionary period at this point, and people were really started to think outside the box, so to speak. 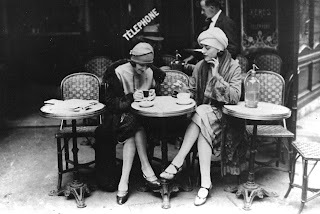 Prohibition had taken hold of the US, which had a hand in increasing the number of Americans travelling to France. Racism was not nearly as much of an issue in Europe as America, which allowed talented writers and performers to really become successful in France when they could not do so in the US (people like James Baldwin and Josephine Baker). At the time when the Side Car would have just started to boom in popularity in Paris - about 1923 - jazz was just starting to become popular in Europe. Most notably, James Reese Europe and his Hellfighters were touring Europe during and just after WWI and planting the seeds of early jazz. This music was militaristic in nature and instrumentation, but swung. It was an evolution of ragtime, and was the beginnings of big band swing to come in the following decades. Europeans had never heard anything like it before, as jazz was a completely American music. Jazz in its entirety wasn't really accepted into European culture until the 1930's, and several French jazz musicians live on in infamy today, such as Django Reinhardt and Stephane Grappelli (both of whom you might have heard playing in bars and cafes in Paris in the 30's while you were sipping your Side Car). Throughout the 1920s, many American musicians, artists, and writers moved to Paris. One such musician/performer was Josephine Baker, who was one of most famous performers of the 20's, despite being black (and that was a big deal back then). She was the first 'person of colour' to star in a motion picture, first to integrate a music hall, and one of the first famous black performers ever. She was an important figure in civil rights issues to come as well. Never really apprecated in America as she was in France, in part because she wasn't white, she still to this day remains a solid influence on American singers and performers. Her stage shows, which of course played upon her ethnicity, contributed to the birth of the term "jungle music," which also described at the time such artists as Duke Ellington, and was more of a racial slur than a description of the music itself. So, to go along with your Side Car from Harry's Bar in Paris, with French Cognac or Brandy and French Cointreau, is one of the more famous performers in France at the time - despite not being French herself - Josephine Baker, performing a piece in 1927 by the American composer of the same period, Irving Berlin, entitled "Blue Skies."